Navy Officer Arrester for Spying Against U.S.
Today, April 11, 2016, Reuters reported that a U.S. Navy officer, Lieutenant Commander Edward Lin, will face espionage charges. Lin was apart of the Navy’s Patrol and Reconnaissance Group, which handles intelligence collection operations. While it has yet to be fully verified, it is believed Lin was sending secrets to either China or Taiwan. The case of Lieutenant Commander Lin would just be a small piece in China’s larger plan for stealing U.S. secrets. The strategic threat of China understanding our military capabilities rivals that of terrorism and cybersecurity, and it is unclear if the U.S. has the ability or understanding to counter this threat. Lin, born in Taiwan, was accused “twice of sending secret information and three times attempting to do so to a representative of a foreign government “with intent or reason to believe it would be used to the advantage of a foreign nation.”” according to Reuters. While Lin may not have had access to highly classified information, it is a known strategy for the Chinese to rely on large numbers of low level workers to gain information. The Chinese work the information like a puzzle, putting smaller pieces together in order to form a larger picture. It is more difficult to find hundreds of low level people, as opposed to known higher ups with sensitive information. The Canadian Navy has also been a victim of Chinese espionage. In 2013 it was discovered that a Chinese-Canadian man, Qing Quentin Huang, was sending information to the Chinese. Huang was arrested for allegedly sending information regarding Canada’s ship building capability. With this information, foreign governments can gain a tactical advantage over a nation’s Navy by preparing for the capabilities it would encounter. The U.S. has uncovered multiple attempts by the Chinese to steal sensitive material regarding economic and military technology and capabilities in the past. Gwo-Bao Min was an aeronautical engineer from Taiwan. In 1975 he began to work at the Lawrence Livermore National Laboratory. An FBI investigation into Min discovered he had been giving secrets to the Chinese regarding nuclear weapon technology, including how to miniaturize nuclear warheads. However, no formal charges were placed on Min, as prosecutors felt the evidence was not strong enough. Katrina Leung was recruited by the FBI to spy on Chinese officials, and during her time with the FBI it is estimated she was paid more than $1.7 million. Leung turned out to be a double agent, and was able to acquire classified information from her FBI handler James Smith. Leung passed along information regarding military, nuclear, and political information to the Chinese for over a decade. Wen Ho Lee was an employee of the Los Alamos National Laboratory where he worked on the bomb-design unit. The FBI began to investigate Lee in the early 1980s when he began connecting with Gwo-Bao Min. Lee was then suspected of stealing the design of the W88 nuclear warhead and sending it to the Chinese. Lee was arrested in December 1999 and indicted on 59 felony counts alleging that he illegally downloaded classified information and violated the Atomic Energy Act and the Foreign Espionage Act. However, after striking a deal with the Federal Government, he only pled guilty to one count, and was later given compensation for a faulty investigation. These examples illustrate the vulnerability of our nation’s classified information to foreign espionage. The Chinese have not just tried to steal our national security information, but also our economic technology and capabilities. The Justice Department has characterized the vast scale of Chinese corporate espionage as a national security emergency. The Chinese stealing U.S. corporate information is costing U.S. companies billions of dollars and over 2 million jobs. Instead of investing in innovation themselves, the Chinese are simply stealing the innovative technologies coming out of the U.S. This allows the Chinese to focus primarily on cheap labor and production, instead of paying larger salaries for innovative thinkers. The U.S. is at a constant threat from foreign governments stealing information. Whether it be security or economic information, the U.S. must look to guard its valuable assets. A stronger focus on CI will be the first step in the right direction to mitigating these threats before it is too late. Secure Freedom Radio is made possible by listeners like you. Has Iran penetrated U.S. electric grid control systems? Is interrogation as a way of obtaining intelligence falling to the wayside? Are Danish street gangs serving as a proxy force for enforcing Shariah law? Michelle Van Cleave, former National Counterintelligence Executive under President George W. Bush, defended the widely criticized National Security Agency on Monday’s Secure Freedom Radio, and detailed why Edward Snowden’s leaks have been so damaging. She justified the large scale of American counterintelligence operations by explaining that the system is responsible for not only the safety of American citizens, but also that of people in peril around the world. Speaking specifically about the information revealed in the leaks, Van Cleave said that due to the uncertainty surrounding what Snowden has and will release, the security problems are not going away anytime soon. While the exposure of national secrets to America’s enemies is damaging in and of itself, Van Cleave further expounded that the Snowden leaks have had a second, devastating impact, just as Snowden intended. “The other part of the damage here that is so incredibly troubling is the extent to which the American public have been misled or confused… into doubting our own intelligence capabilities and the people who are responsible for carrying out those intelligence activities,” she said. Van Cleave acknowledged that it is reasonable for the American public to be uncomfortable knowing that the government is keeping secrets, particularly if those secrets may be about them. “I wish that it were possible for the American public to know all of the things that US intelligence does because I think that they would be so proud and so grateful at some of the amazing accomplishments that have taken place,” Van Cleave concluded. MICHELLE VAN CLEAVE, former National Counterintelligence Executive, explains the unique difficulties caused by the ongoing Edward Snowden disclosures. CHARLES FADDIS, former head of CIA’s WMD destruction unit, gives his insights on the role of CIA leadership in Washington on the Benghazi talking points. GORDON CHANG, of Forbes.com, examines the economies of China and Japan and what the de-linking of the two means for future conflict in the region. LUIS FLEISCHMAN, of Center for Security Policy’s Menges Hemispheric Security Project, postulates that radicals being trained in a Bolivian school purportedly run by the Iranian Revolutionary Guard Corps, in association with Hezbollah, may be used to support the floundering Maduro regime in Venezuela. In this latest Center for Security Policy Occasional Paper, former head of U.S. counterintelligence Michelle Van Cleave discusses the damage caused by so-called “leakers,” Bradley Manning and Edward Snowden, the false choice of security vs. freedom of speech, and the need for responsible leadership in making decisions about the intelligence capabilities the U.S. needs and why. Van Cleave offers insights into the manner in which leaks cause damage to vital American interests, makes recommendations on how better to guard against future unauthorized disclosures, and calls on Congress to ensure that U.S. intelligence-gathering capabilities are not further harmed by the environment of public distrust the Obama administration has created. Read the paper at the link below. MICHELLE VAN CLEAVE, former counterintelligence executive and member of the Jack Kemp Foundation, dives into the US intelligence situation, looking at the damage done by Snowden and Manning and the history of checks and balances on covert organizations since the time of the Founding Fathers. Dr. PAUL KENGOR, of Grove City College, reflects on the achievements made by the late Reagan-era Judge William P. Clark. ADAM KREDO, of the Washington Free Beacon, examines the chemical weapons attacks in Syria and Al Jazeera entering the American market. FRED FLEITZ, of Lignet.com, gives an overview of several events occurring throughout the world including; the recent chemical weapons attack in Syria, the Nidal Hasan trial, and the new Saudi order. With Deborah Burlingame, Joseph Klein, Michelle Van Cleave, Peter Brookes. DEBORAH BURLINGAME, co-founder of Keep America Safe and sister of American Airlines Flight 77 pilot Charles “Chick” Burlingame, joins Frank to talk about the recent uncovering of a piece of equipment from one of the highjacked airlines that hit the World Trade Center on 9/11, as well as the ongoing debate over whether or not it is appropriate to build a “mega-mosque” at 51 Park Place. JOSEPH KLEIN, reporter for Front Page Magazine, explains why the UN attempt to investigate the use of chemical weapons in Syria–originally requested by the Syrian government–has stalled. Former head of U.S. counterintelligence under President George W. Bush MICHELLE VAN CLEAVE discusses the investigation the FBI made several years ago into the older Tsarnaev brother after receiving a tip from Russia, and puts it in the context of the historical tension between the American and Russian intelligence communities. PETER BROOKES, Senior Fellow in national security affairs at the Heritage Foundation, explains why Obama’s claim that “Al Qaeda is on the path to defeat” is a great mischaracterization of the facts. This is the fifth issue of the Center for Security Policy’s National Security Policy Proceedings, a new quarterly journal. It is available in paperback at Amazon.com for $8.00. 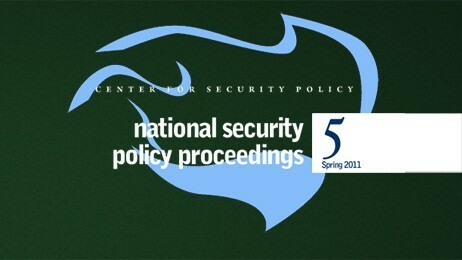 National Security Policy Proceedings represents the Center’s compilation of transcripts of remarks given by featured speakers at these gatherings. In some cases, speakers have chosen to submit their remarks to Proceedings as original articles. Additionally, Pro- ceedings includes book reviews of recently published national security-themed books, reviewed by eminent scholars in the field. In publishing Proceedings, the Center has sought to provide the reader with authoritative yet accessible commentary on the most pressing issues of national security, foreign affairs, defense policy, and homeland security. Because the speakers and those in atten- dance are routinely in contact with one another and are often col- laborating on analytical and educational efforts, it is our intention that Proceedings give the reader a unique window into how those in the national security policy community convey and exchange ideas with one another, among friends and colleagues. Revolution in Middle Earth: Towards Catastrophe or Democracy? 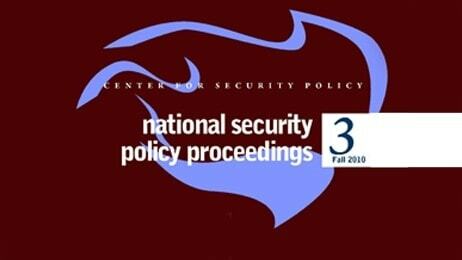 This is the third issue of the Center for Security Policy’s National Security Policy Proceedings, a new quarterly journal.